Not really a day late, as technically it is still New Years Day. Wow, I can't believe it's 2011 already! Time is seriously flying by so fast. During the entire winter holidays I keep saying how I couldn't believe it was this date or that date already. NYE around here was pretty mellow, Brett and I stuck with our tradition of making an extravagant dinner of king crab (not crap, right Natalie? ), salmon, and steak before having a few celebratory beverages while watching the ball drop in Times Square in New York on the telly. Brett and I promised each other that next NYE we should actually do something more exciting and not use the Munchkin as an excuse to stay home! Anyhoo, did anyone make any resolutions? I didn't. But then again, I never do. Mainly cause I never keep them and then when I look back on the year I feel like a failure cause I didn't stick to a single resolution. That's why I prefer to make goals. Made randomly throughout the year. Although, with that said, I do hope that 2011 is the year that I sew more, bake more, knit more, read more, exercise more, and get the Munchkin involved more. And maybe, just maybe it'll be the year that I buy less yarn and use more stash? I'm also hoping that 2011 will be the year that Brett and I get to go on an actual date. Without the kidlet around. Ahh...one can dream. 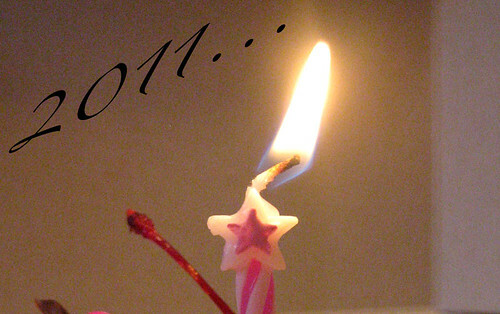 I wish you all a very Happy 2011! I'll babysit in exchange for MisoCrafty project/notion bags. Really. I will.